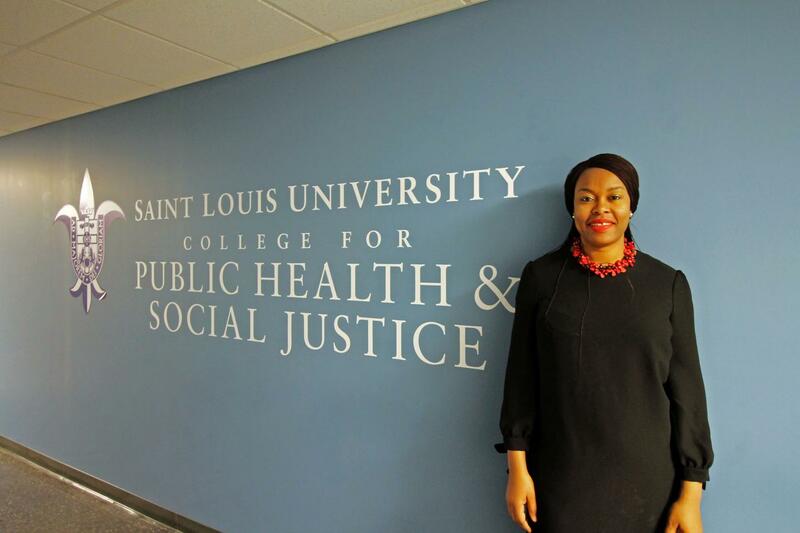 ST. LOUIS – Nigerian youth are at the epicenter of an expanding HIV crisis in Sub-Saharan Africa. As a country, Nigeria ranks second in the in the world in new HIV-Infections among youth, youth living with HIV and AIDS-related death among a youth population. HIV testing is an important early entry point to accessing preventive education, care and treatment. Yet fewer than one in five Nigerian youth have been tested. A Saint Louis University study seeks to change this by developing and implementing Innovative Tools to Expand HIV Self-Testing (I-TEST) for at-risk youth ages 14-24. Juliet Iwelunmor, Ph.D., an associate professor of global health and behavioral science and health education in SLU's College for Public Health and Social Justice, was awarded a $2.3 million grant from the National Institutes for Health to develop and evaluate the I-TEST project. Partnering institutions on the grant include the Nigerian Institute for Medical Research, University of North Carolina, Chapel Hill, and New York University School of Medicine. The project will partner with Nigerian youth and their local communities to expand coverage and generate demand for HIV self-testing. "Young people in Nigeria typically have lower healthcare access and lower HIV testing than other age groups, yet they experience increasing HIV incidence rates, high HIV prevalence and undiagnosed HIV infections," Iwelunmor said. "HIV self-testing decentralizes HIV testing by allowing an individual to collect their own test specimen, perform a test and interpret the result, often in a private setting, either alone or with someone he or she trusts." I-TEST supports Nigeria's strategic objectives to increase access to HIV testing services to enable 90 percent of young people living with HIV to know their status and be linked to relevant services. "Unlike conventional top-down interventions that haven't worked for many youth, I-TEST will use open challenges and entrepreneurship training to facilitate youth engagement, participation and innovation in solutions that generate a demand for HIV self-testing," Iwelunmor said. Iwelunmor says that innovative solutions that leverage the resourcefulness and resilience of the young people are needed to decrease HIV transmission. Researchers will develop youth-friendly HIV self-testing services based on open challenges and apprenticeships. "Open challenges spur new thinking and allow large numbers of youth to become involved and engaged in developing and delivering HIV services," Iwelunmor said. "Once more youth are engaged in creating more effective HIV services, entrepreneurship pairs young people with local youth entrepreneurs to build capacity for launching new start-up services. Open challenges and entrepreneurship training can leverage the strengths of young people to generate demand for HIV self-tests and uptake of essential HIV prevention services." Joseph Tucker, M.D., Ph.D. These trials have led to improved rates of HIV testing and condom use among at-risk youth, but none of these approaches have been used in Africa. Once HIV self-testing strategies that meet the needs of the population are identified, researchers will develop a comprehensive plan for enhancing uptake of other HIV prevention services – including HIV pre-exposure prophylaxis and behavioral approaches – for at-risk youth. Two strategies will be selected by a local steering committee in Nigeria made up of experts in health, technology, entrepreneurship, and digital/social media as semi-finalists and evaluated in separate local government pilots. To determine the effectiveness of a finalist participatory intervention on HIV testing and other key HIV prevention outcomes. "It is our hope that the I-TEST will reconfigure HIV prevention services drawing on the creativity and power of Nigeria youth, while nurturing their participation in HIV self-testing service design, implementation and evaluation." Other principal investigators on the project include Oliver C. Ezechi, M.D., Ph.D., deputy director for research at the Nigerian Institute of Medical Research, and Joseph D. Tucker, M.D., Ph.D., associate professor of medicine at the University of North Carolina, Chapel Hill. Other co-investigators include Rhonda BeLue, Ph.D., professor of health management and policy; Jami Curley, Ph.D., associate professor of social work; and Hong Xian, Ph.D., professor of biostatistics; all of SLU's College for Public Health and Social Justice; Barry Bayus, Ph.D., the Roy O. Rodwell Distinguished Professor in Marketing, Kate Muessig, Ph.D., assistant professor of public health, Nora Rosenberg, Ph.D., assistant professor of public health, and Weiming Tang, M.D., assistant professor of medicine, at University of North Carolina, Chapel Hill; Olugbenga Ogedegbe, M.D., the Dr. Adolf and Margaret Berger Professor of Medicine and Population Health, New York University School of Medicine; and Laura Gardner, program coordinator of the Richard A. Chaifetz Center for Entrepreneurship at SLU. This study was supported by the National Institute of Health, Eunice Kennedy Shriver Institute of Child Health and Human Development, 1UG3HD096929-01 and is part of the Prevention and Treatment through a Comprehensive Care Continuum for HIV-affected Adolescents in Resource Constrained Settings (PATC3H) consortium.